The Ornish Diet has been developed by Dr. Ornish originally for use by his patients. While many weight loss diets are low-fat, some fall into the category of being very low fat (where only 10-20% of the calories come from fats). 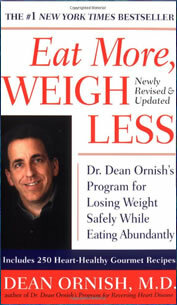 Dr Dean Ornish wrote a book called Eat More, Weigh Less. The Ornish Diet he prescribed is basically vegetarian. Meat, poultry, and fish aren’t recommended. The only dairy allowed is fat-free yogurt, milk, fat free cheeses, and egg whites. Foods not allowed are; all fats, oils, nuts, seeds, avocados, refined carbohydrates (including sugar, white rice, and white flour). Other than these ‘banned’ foods, the diet allows you to eat all you want without any weighting or measuring. What’s left is predominantly fruit and vegetables, and grains. Water, tea, coffee, skim milk, juices. Find other low fat recipes here. All extreme or restrictive diets are difficult to follow and The Ornish Diet is just that. They also run the risk of depriving the body essential nutrients and minerals. Restricting fish, nuts, and seeds immediately cuts of any source of Essential Fatty Acids such as Omega 3. He eliminates many foods that are now considered some of the healthiest foods a dieter can eat, such as avocados and walnuts. We’ve learned a lot about fats since this book was published and his advice is pretty outdated. It is good to eat plenty of fruit and vegetables, but current research into nutrition and causes of obesity is beginning to show us that cutting out all fat is not necessarily the way to go. I was about to give my own opinion, when I thought it would be better to direct people to a presentation given by Ornish and let them decide for themselves. All the members of may family who have lived to a ripe old age including my Dad who is 85 and going strong lived on meat, butter, fried food and all the stuff that’s supposed to be bad for us except that they didn’t eat processed food. People who live on totally restrictive diets tend to be boring evangelists. I have friends who worry continually about what they are eating and what it contains. They comment on other people’s diets to the point of rudeness and as far as I can see none of them are healthier or fitter than my other friends who enjoy life, living and food. My family are rambunctious,full of life and humour, enjoy family occasions where food is shared and enjoyed. I’d rather live a happy and joyous 85 years than a miserable 100! WOW!!! Most of you don’t have a clue! The fact are crystal clear!! everything you need to sustain a healthy life and be disease free are in plants. All the vitamins, minerals, proteins, fats, calcium, iron and everything else you will need to live well. these facts are well documented the only thing that will be lacking in a plant based lifestyle is vitamin B-12 that can easily be found in seaweed. People before you comment on “the dangers” of a plant based diet DO THE RESEARCH!!! There are about 13 nutrients not found or are very low in plant foods. As far as having to eat seaweed to get certain nutrients like DHA, EPA, B12, etc shows that the plant based diet is not natural for humans. Humans live inland far from seaweed and would have no access to those nutrients. They need a source for stuff like EPA, DHA, Zinc, B12, Selenium, and a few others to maintain a good level of health. You don’t have a clue! The facts are crystal clear!! B12 is available from bugs, natural water sources,…things our ancestors would have eaten. Listen guys, this guy has it all wrong! If his way of eating was the right way then he would be the picture of health. He looks soooo bad. Look up a current picture of him,(sagging skin, straw for hair). I tried to eat this way for many years and not only could I not maintain my weight, but I too became gaunt looking (think Madonna before facial fat injections). Our bodies want clean (grass-fed) meats and yes fats! Don’t listen to him, listen to your body. I need to try something, and for me regular eating is not helping me become or even stay healthy. There must be something to eating more fruits, vegetables, less fat, and will let you all know if this Dr. Ornish lifestyle works for me! Talk to you in about 2 months! this is the grossest most obvious diet in the world. So your telling me if i eat nothing but tasteless rabbit food I will lose weight?? WHATS THE CATCH???! It’s a no brainer that eating what nature intended us to eat, unprocessed fruits, vegetables, and minimally processed grains as well as legumes, nuts and seeds is the way to go. It’s how to incorporate this type of eating in our society that is the greatest challenge. I’ve been reading “Healthy at 100” by John Robbins who notes three societies that the elders live to near or over 100 as the norm and it’s based on the whole grain foods type of eating. Where I think we go wrong is what commercialism sells us. Buy the latest low fat cookies and processed this and that to loose weight. It lead me to wait gain because I wasn’t eating what was whole grain, just what was low fat and I was over eating on graham crackers, bagels etc. I’m going to try it again, but this time, with the knowledge that the western diet is deadly and I need to say no to the processed foods, white bread/cereals, sugar(I’m addicted to). This remains to this day the only DIET (combined w/ lifestyle, aka go read Okinawan diets as well, every longevity diet need lifestyle changes too) that is scientficially proven to fix your heart. They are now studying effects on cancer as well. These comments about reduced nutrients show lack of understanding. For example … less protein intake means you require less calcium. The complaint about reduced EFA’s doesn’t mention once what humans really need, only that compared to other diets, which btw are unhealthier, there is more EFA in it. Again, looking at the whole picture, Ornish is the only diet of the 100s listed in this site that has science behind it. The most complaints stem from those who yes are addicted to sugar, fat, cheese, oils. You need a detox to remove the cravings (try McDougalls 10 day) and then start up w/ Ornish. I did it and I am a born and bred cow eating sombatch from the sticks. God also said thou shalt not kill! It’s funny (not really) how arrogant we are to kill animals. The Bible says in the end times there will be those who say do not eat meat….but Paul says to eat what is put before u but to always ask God to bless it first . The Lord gives us three score and ten (70 years)and I am sure that if u include the deaths at birth it still does not exceed that number. Why suffer eating things u dont want for years and still die in the average life span when u can eat what u like in moderation and ask the Lord to bless it and enjoy your life.. P.S. my great grandmother lived to be 91 and grandpa lived to be 106…. so……. The AHA recommends at least 2 servings of fatty fish a week. The omega 3 in fish is also essential for proper brain development (the brain is mostly made out of fat). The Japanese diet is high in fish and they enjoy the lowest mortality rates in the world. i am 49 m,history of cad,lad 95%occulted,rca99%.lcx 50to60%at two places.was done ptca to lad with 2 stents.how long is it going 2 last? is cabg more suitable for me .what diet should i follow? can i take liver (mutton)? Hi Vijai, I have stage two heart failure and I recently started the Dr. Ornish diet 2 weeks ago. I also started doing exercise every day, just taking a walk, for 30 minutes every day. At the beginning I was gasping for breath after just walking out to the road to get the mail. When I started exercising I could only walk one quarter mile if I stopped six or seven times to catch my breath. Yesterday I walked a full half mile including two uphill sections and I only had to stop three times. My breathing is better, my joint pains are gone, and my ankles are no longer swollen. This is after just two weeks, I can’t wait to see how it will be in three months. I highly recommend you try the Dr. Ornish diet! I had open heart surgery for an insufficient aortic valve. The valve was replaced with a porcine valve, and I did very well post-op, EXCEPT, while in the CICU, I was fed the Ornish diet. I hasten to assure all that I did not have any discernible heart disease. My cholesterol was 175. HDL/LDL both in normal range. I cried every time a tray arrived. No amount of pleading would convince them that I was suffering from lack of nutrition. When I was sprung to the rehab section of the hospital, my Primary Care doc put me on a regular diet. Life was once again bearable. I eat prudently, veggies, fruits, meats sparingly, 2% milk when I do drink milk. I buy butter by the half-pound and it lasts for a month. You may live longer on the Ornish Diet – or it may just seem longer. As one ages, there are very few pleasures left. Don’t take away the next to the last one. I think it would be good to add to this, that even going further and cutting out dairy is not only sustainable but forms part of a diet that has saved many lives who till the diet had serious heart disease. The reversal of arteries narrowed over decades does not happen overnight but the angiogram photos after some years tell the story. The book “Prevent And Reverse Heart Disease” ( Google it) by Surgeon Esselstyn from the famed Cleveland Heart Clinic details a trial that like Ornish’s, who shows heart events were dramatically reduced and heart disease reversed, in his case shows heart events being eliminated altogether. We can offer our opinions all day long. Let’s read the research and make up our own minds. Julia And Judy… when did you guys drop out of highschool? I’m just curious how people get enough protein on this diet. Is it from the dairy products? It’s certainly not good to miss out on essential fatty acids, but maybe you could use this diet and take a fatty acid supplement that contains everything you need for the day. Then you would get the benefits of decreasing the fat you don’t need, while still keeping the fat you do. But there are probably lots of important vitamins and minerals you are missing out on as well. And we can’t forget that in order to get the proper amount of fat-soluble vitamins (A, D, E, K) you need to get enough fat. It just seems to me that on this diet, there might be some nutritional deficiencies, which is never good. Hopefully, Dr. Dean Ornish has considered that, and has a plan to meet the bodies needs. If so, it is not explained here. Please don’t go on any special diet without first seeing a doctor or nutrition councilor, especially if the first time you’ve heard about it was online! This is a “plan,” a lifestyle, and the program does include all five areas: food, exercise, yoga, meditation, support group. There are decades of research results showing that one must include all of these to be truly healthy. Ornish has published many studies verifying this. If a person is truly motivated to be fit, and they still question the efficacy of this program, all they have to do is google Dr. Ornish’s research. I haven’t seen one cardiologiest in office who has a clue what this program is about, or why it requires attention to all five areas. The sad thing is that they are too lazy or disinterested to look up the research. That is why we need to actually read Dr. Ornish’s research for ourselves. If you do, you will understand why “Judy” is totally misinformed. I’ve been following the Ornish Reversal Diet for over 30 years now, except when I started it in 1978, it was known as The Pritkin Reversal Diet. I was 19 years old then, but inherited bad genes. My total cholesterol was 205 mg/dl. Within 6 weeks on the Pritikin Reversal Diet, my total cholesterol plummeted to 94 mg/dl and I cut almost 2 minutes from my 10K roadrace times as well! All other risk factors improved dramatically as well, but I’ll spare you those details. In 2006, my son died tragically in a car accident 2 days before his 17th birthday. In the following three years, I increased my intake of alcohol (1-2 glasses/day red wine) and fat and cholesterol – more olive oil, poultry and seafood – the so-called Mediterranean Diet. All else remained the same – exercise, vegetable intake, fiber intake, etc. During a routine physical on Dec 3, 2008, I found that my cholesterol had increased to 195, triglycerides to 315 and glucose to 105. I had become PREDIABETIC! On the Mediterranean Diet! So, I promptly went back on the Ornish Reversal Diet. As of Jan 8, 2009, just over a month later, my cholesterol had dropped 30% to 137, triglycerides dropped 54% to 146 and glucose dropped 19% to 85. I am super healthy again, thanks to the ultra lowfat, low GI, vegan Ornish diet! Don’t let anyone fool you into thinking this diet is unsustainable or unhealthy. It’s not only sustainable and healthy but it is clearly the diet homosapiens were designed to be on! From the starch-digesting enzymes in our mouths to our mobile lower jaws to the long, convoluted digestive tract (carnivores and omnivores have short, smooth intestines), we are primarily vegetarian creatures who can tolerate rare intake of animal products, but they must resemble wild game and fish in that they must have a 1:1 or at least 2:1 ratio of omega6/omega3 fatty acids and contain no more than 5-10% fat by calorie, just like our ancestors occasionally consumed. It is a misnomer that we are hunter-gatherers. Given exhaustive research into existing primitive cultures and studies of coprolites (fossilized homosapien feces), it is clear that we were primarily GATHERERS who also hunted occasionally, primarily when the hunting was easy. Hunting typically requires HUGE expenditures of energy, usually more than what the animals provided when eaten as food. Not only that, but as stated above, the grass-fed wild game consumed had the fatty acid profile of fish – omega6/omega3<2.0. Our domesticated land animals don’t look anything like wild game, with ratios as high as 30 and total fat content 4-8x higher. That’s why people eventually get sick and die in record numbers when they eat them too often! Not only all that, but the Ornish Reversal Diet is the only plan that has actually MEASURED regression of athersclerosis via precise measurements! Atkins and Mediterranean have NOT done this yet. As Ornish found in his research, not all methods of improving risk profiles resulted in regression at the arterial level! For example, drugs can lower chol as much as the Ornish diet, but don’t result in regression in as many people or the same degree of regression as found on the Ornish diet. Worse yet, a large % of those on the drugs actually get worse, whereas 0% of those on Ornish got worse. They all had regression or stopped progression. 99% of the folks on Ornish Reversal also dramatically lowered LDL and total cholesterol, but even the folks in that 1% who couldn’t get their tot chol below 200 still experienced regression…as long as they followed the diet. No one knows why. According to Framingham, you need to get below 150 to prevent CAD. So, until someone actually measures what happens at the artery lining on the Atkins and similar plans, I think think it’d be incredibly foolish to go off, half-cocked, and follow them, given the evidence that they actually cause heart disease. In the meantime, the only diet proven to prevent and reverse CAD (as well improve risk profiles for CAD and other diseases) is the ultra-lowfat, low-GI vegan plans like Ornish, Pritikin, McDougall and many others. Julia, this diet is not a vegan diet as it includes cheese and yoghurt. It may be a vegetarian diet but it is not a vegan one as vegans do not eat dairy products. Is Judy confusing this with Atkins?? ive been on ornish for 1 1/2 years now – sure its tough, but my bmi is 23, b/p 110/72, ive lost 48 lbs, total chole.-84, and i feel great-nothing good comes too easy-thanks dr. ornish! Judy, could you please point out the proof – increase in diabetes, overweight, and heart problems? I’m not a Dean Ornish fan. I don’t even know who he is. I just wound up at this site after reading a newsweek article, doing a search, and getting here. The appeared to be CLEAR EVIDENCE that this diet dramatically improves all of those things. I am searching high and low for what you’re suggesting and find nothing. I find it extraordinarily hard to believe that strictly following this diet would lead to an INCREASE in diabetes, obesity, and heart disease. Are you just making this up for some odd reason!?!? That’s nuts. Please link to this proof or go back to your padded room. Being vegan or vegetarian is sustainable. We are human we have big brains and we can figure out how to live with out meat. The true story is that people have different needs. Some do very well with a low fat diet. Some do very well with a healthy high fat diet. Until we start looking at individuals instead of a “one size fits all” approach there will be a lot of conflicting information. I suggest consulting with a healthcare practitioner who is familiar with looking at genotyping, metabolic typing, or some method of determining your unique needs. check out http://www.naturopathic.org for a practitioner in your area. This type of diet is now proving to increase diabetes,overweight and heart problems,all shown through research. So what really is the true story? I’ve been eating like this for about 15 months now.. with chocolate also involved >_<. But yeah, it’s definitely sustainable, and I’m healthy as a horse. Oh no, you saved a few animal’s lives! Of course you should feel betrayed! How dare Dr. Ornish make you eat veggies! I felt betrayed. I didn’t find out it was vegetarian until I was half-way through the book. The entire Ornish program for heart disease also involves meditation and social interaction.